Terror Films has released NIGHT OF SOMETHING STRANGE upon the world. The story follows five teenage friends. They set out for the beach on their spring break vacation. Their good times are cut short when one of the group, Carrie (Toni Ann Gambale), contracts an STD at a gas station bathroom. The friends get detoured to an isolated motel in a small town. Here, the STD turns out to be something that can’t be treated by a shot of penicillin and it begins turning those infected into the living dead. The film has played at multiple festivals and it has won several awards. NIGHT OF SOMETHING STRANGE showed at the Fangoria Chainsaw Awards (2017). Here, it was nominated for “Best Makeup & SFX.” The film also showed at the Phoenix International Horror. At the Sci-Fi Film Festival (2016), NIGHT OF SOMETHING STRANGE won “Best Horror Feature.” At the HorrorHound Weekend Film Festival (2016), it won “Best Special Effects – Feature “ and it was nominated for: “Best Feature,” “Best Director” and “Best Actress.” At the Crimson Screen Horror Film Fest (2016), it won a “Jury Award,” “Best Special Effects” and “Best Actor.” The film was also nominated for: “Best Feature,” “Best Director,” “Best Produced Screenplay –Feature,” “Best Actor,” “Best Actress” and “Best Special Effects,” at this film festival. The film has been recognized across North America. As part of Terror Film’s new Worldwide digital release model, the film will be made available across multiple digital and VOD platforms; it will also release in several countries and territories. On VOD, it will be available on: iTunes, Amazon Instant and many other platforms. Territories hosting the release include: the U.S., Canada, the Middle East, North Africa, Asia, the Caribbean, Ireland, the U.K. and Pan-Russia. 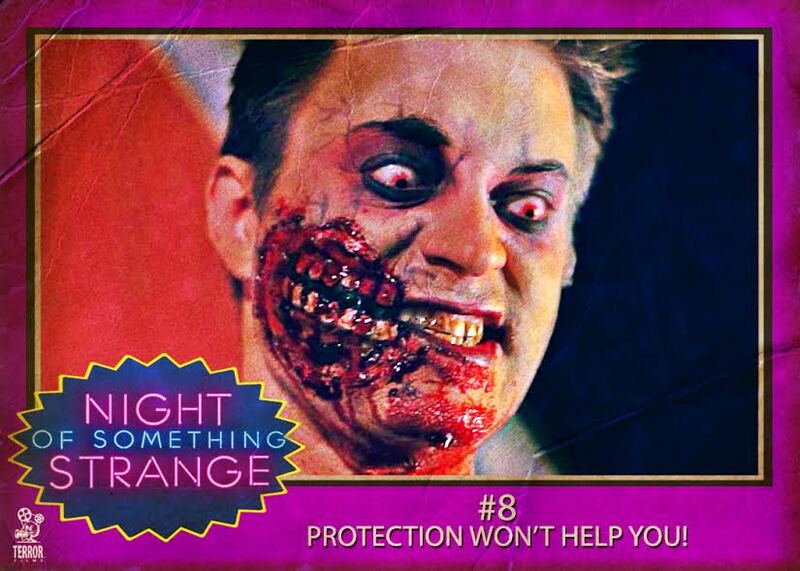 Terror Films is also offering a special promotion, for NIGHT OF SOMETHING STRANGE. 8 digital trading cards will be made available at eight specific Horror Blogs and websites. Each site will host one card and one exclusive clip from the film. The first 25 horror fans, that digitally gather all 8 of the trading cards and repost them on the Terror Films’ Facebook page, will receive one free download for the film on iTunes! #1: SOMETHING UNNATURAL IS WAITING…! #2: DIRK JUMPS IN TO JOIN THE FIGHT! #3: TRANSFORMATION INTO THE MACABRE! #5: I’VE BEEN WAITING FOR YOU. #7: GET HER OFF OF THE CAR! #8: PROTECTION WON’T HELP YOU! Below you can watch the official trailer, a clip exclusive to us called 'Broken Mailbox' and below all of that is one of the 8 trading cards. Can you find them all?